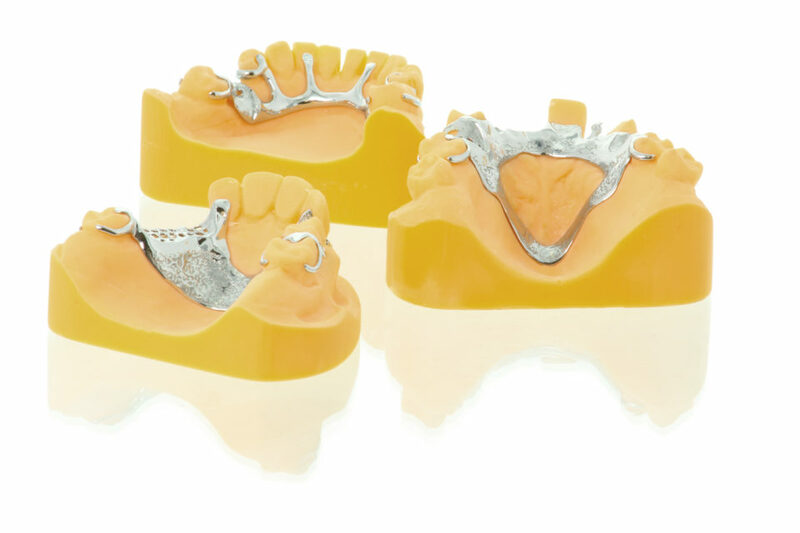 Global engineering company Renishaw worked with Egan Dental Laboratory to fully digitise the design and manufacture of Removable Partial Dentures (RPDs), also known as chromes. The move to digital techniques halved the time required to manually make a chrome framework and resulted in the production of stronger, more accurate, yet thinner RPDs. In an official release, Renishaw shows how it helped Egan Dental Laboratory to develop a robust additive manufacturing process for Removable Partial Dentures (RPDs). Egan Dental Laboratory a family run business based in Yorkshire, United Kingdom supplies dentists with chrome frameworks, from a one-tooth denture to implant-supported prostheses. The laboratory was using traditional methods to manufacture and design its prostheses by using such processes as the lost wax technique. This manual process took the technicians two hours to complete each cast chrome framework. A wax pattern is created of the prosthesis, sprued, invested and turned into a mould. The metal is then cast, desprued, finished and polished to produce the chrome. Lost wax casting is prone to error. One reason for this is that, when casting metal by hand, the cobalt chrome material shrinks on cooling. The technician must make models based on this principle, using expansion liquid so that when the metal shrinks during casting, the resulting RPD still fits. 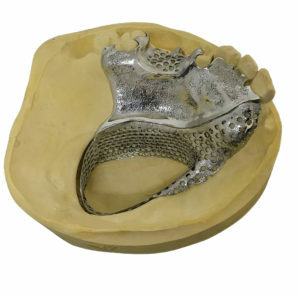 Another problem with casting by hand is that the denture is constrained by manufacturing limitations, making it difficult to achieve a thin cross section. Attempting to do so often results in the deformation of the prosthesis. Errors can also be introduced if the molten metal doesn’t enter the mould cleanly, causing frames to be incomplete. There is also a risk of porosity if the molten metal is overheated, which can also cause the introduction of excessive carbon, which can lead to structural weaknesses. Egan Dental Laboratory believes the most accurate method to produce removable partial dentures is additive manufacturing. To develop a consistent internal work-flow for the additive manufacturing of RPDs, Egan Dental Laboratory partnered with global engineering company Renishaw. For around a year, the two companies worked together to develop a process suitable for every possible RPD. During the process, the laboratory transferred designs to Renishaw, who then produced the dentures and adapted AM system build parameters based on feedback. The new, digital process begins when a technician draws on the master model by hand and uses a scanner (such as 3Shape, DOF, Medit) to begin the computer aided-design (CAD) design. At the push of a button, the design is sent for manufacture. Using Renishaw’s additive manufacturing system, the denture is built using laser powder bed fusion (LPBF). A high-powered ytterbium fibre laser beam is focussed onto the powder bed, selectively melting 40-micron layers of cobalt chrome powder until the complete component has been built. “The new process takes just 40 minutes of manual work; less than half the time of the casting process,” added Egan. “The dramatic reduction in labour required, means we could double the laboratory’s productivity, as well as providing a cleaner, safer environment for our staff. I have also been able to use the additional time to develop new products, give lectures and share my experiences of digital dentistry with the rest of the industry. Another benefit for the laboratory is that with additive manufacturing there is no risk of carbon or miscasting and a reduced risk of porosity. 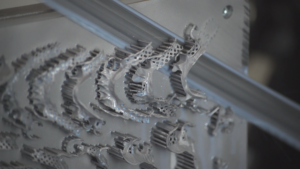 “Working with Renishaw has been amazing. We have developed a process and a product that brings RPDs into the digital revolution and I urge the rest of the dental industry to grab digital technology with both hands. As an industry we must move forward — additive manufacturing provides the ideal platform for us to achieve this,” concluded Egan.